Barinder Saluja, Chandigarh ,June 03: Hot Millions, a dream venture of Col. A.B.Singh, the founder of this amazing food chain of the India, added another feather to its crown today by successfully opening one more food joint “High Point”, right in the heart of the city’s sector 17. Everyone says that Col. A.B.Singh was god gifted, had Midas Touch, that what ever he touched turned mouthwatering, and this has been proved in all these years. Col. A.B Singh retd. from Indian Army had an ambition to tickle the taste buds & fill the bellies of the citizens of the city beautiful. So, he started a unique venture of Fast Food by the name of Yankee Doodle way back in 1977. This was from where Midas Touch started working. Then, was no looking back, it was his hard work and quality presentation which led to the vast empire of Hot Millions spreading its wings to each & every corner of the city and also overseas to U.S. He was joined by his equally amazing and hard working sons, Capt. Mohan Bir Singh & Mr. Aman Bir Singh, who collectively, have added feather after a feather to become a colossal name in the field of restaurants. Today, the Awesome Duo had again proved that the whole family has the Midas Touch as far as eateries are concerned. They have dedicated another belly tickling joint to the chandigarhwallahs by the name of “High Point”, a multi cuisine family restaurant. ” We are dedicated to serve the community with best of the foods in the world. By the grace of God & blessings of our parents, we are heading towards being the number one in the hospitality industry. High Point is our 15th outlet in the tricity dedicated to serve the hungry one’s”, explained Capt. Mohan Bir Singh. “The cuisine in our latest gobbling hangout is of buffet system which includes salads to pastas to continental to Indian, having in store for all the food frenzy people, whether vegetarian or non-vegetarian. 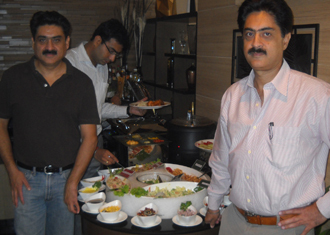 The buffet costs INR 450/= (taxes extra) for a non-veg food and guest can also order for a glass of wine or liquor of choice to be served on a trolley, as an appetizer only to increase the hunger”, exclaimed Mr. Aman Bir Singh with a smile of his lips. “Our staff at High Point is fully trained in the field of hospitality industry and we are serving the best value for the money in the region”, added Mr. Aman Bir Singh. High Point has exciting cuisines of the World and is continuing the journey. Our fine dining multi cuisine menu has been specially crafted for food lovers and is sure to tickle your taste buds. Also available is delicious sumptuous “all you can eat” Buffet at lunch & dinner which include Pan Asian cuisine with its unique herbs and condiments like soy, red hot chillies, sesame, garlic & ginger ; savor the Prawns, Chicken, Meat Balls & Black Mushrooms in Hot garlic sauce, oyster sauce & pan fried Soya Cheese. The myriad taste of European Cuisine: Mushroom Melt & Donor Kebab in Appetizers. Mushroom Steak, Antipasto Green Olive, Black Olive Chicken Steak, Chicken Piccata, Fish Steaks with pepper corn & homemade lamb pie in Main Course. Spaghetti, Fettuccine & Lasagna- pasta cooked with tongue tickling sauces and a whole gamut of vegetables. The state-of-the art interiors designed ingeniously by another family member, Mrs. Bandana Mohan Bir Singh, an architect by profession. So, one can say that the family is full of genius people whether take it to be food or designing of interiors. High Point’s exclusive interior will leave a lasting impression on its guests and its unique ambiance can be felt as soon as guests walk through the door .The design of its interior is modern. Elegant teak furniture in warm brown tones creates a timeless atmosphere. High Point is the name taken from their another venture in U.S., where Hot Millions is serving the Americans by the same name since 6-7 years now. After creating its charisma in overseas, High Point is ready to shower the Chandigarh’ians with the out of the world delicacies. A MESSAGE OF EXPANSION THROUGH * THE INDIA POST* !